The habit of nesting in bird houses has been adopted by individuals of many species which would not ordinarily be expected to make use of such homes, and this may be taken as indicating that it will become more general from year to year as facilities are afforded and as the number of birds hatched in houses increases. 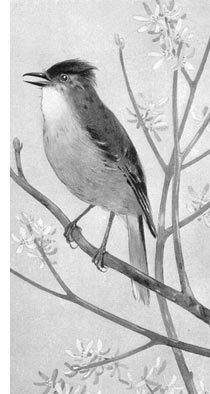 That western wrens and bluebirds should take as naturally to artificial shelters as did their eastern relatives was to be expected. On the other hand, the use of houses by birds which until recently had persistently ignored them is surprising and must be considered a victory for those who have studiously attempted to enlarge their circle of feathered neighbors. Woodpeckers, nuthatches, and titmice excavate their own houses, usually new ones each year, leaving the old homes to less capable architects. Builders of artificial houses generally go to the woodpecker for designs, and by varying styles to suit the tastes of different kinds of birds, have been rewarded by such tenants as chickadees, tufted titmice, white-breasted nuthatches, Bewick wrens and Carolina wrens, violet-green swallows, crested flycatchers, screech owls, sparrow hawks, and even some of the woodpeckers, the master builders themselves. Flickers readily accept houses built according to their standards. Red-headed woodpeckers are willing occupants of artificial houses, and even the downy woodpecker, that sturdy little-carpenter, has, in one instance at least, deemed such a home a satisfactory abode in which to raise a family. Shelters having one or more sides open are used by birds which would never venture into dark houses suited to woodpeckers. They have been occupied by robins and brown thrashers, and, in one instance, by a song sparrow. The number of house birds may be still further augmented as time goes on. All of the commoner woodpeckers are likely to be included, as are several of the small owls and wrens, and a few of the wild ducks, as the golden-eye. The wood duck is already known to use nesting boxes. Houses set close to streams in the western mountains will probably be occupied by ousels or dippers. Florida grackles sometimes breed in flicker holes and may be expected to occupy houses now and then. In every locality having trees there is a group of birds ready to appropriate houses when they have the opportunity.